The Hike to Sheep Lake via Nannie Ridge begins just east of the campground at Walupt Lake. The trail is very steep at first and gains about 2000' in the first 2 miles. Most of the first 2 miles is in dense forest with very few views. At about 2 miles the trail passes over the crest of a spur ridge of Nannie Ridge and one can hike directly to the top of Nannie Peak from this point. 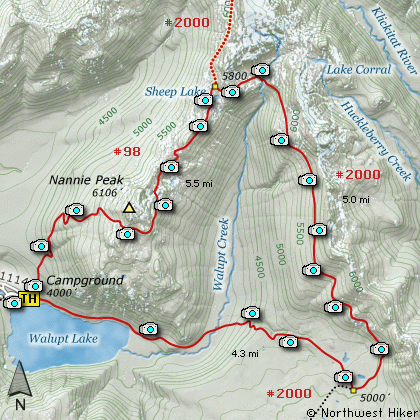 However, you continue to follow Trail #98 to go to Sheep Lake or the junction to the Pacific Crest Trail #2000. After passing the crest of the ridge, the trail drops a couple hundred feet in elevation as it follows Nannie Ridge to the northeast. From this point on you will be presented with many fabulous vistas. In season the trail is lined with a wonderful display of wildflowers. At 4 miles you will come over the crest of a small ridge and Sheep Lake will be directly below you. Keep you eye open for mountain goats. I have seen many over the years in the Goat Rock Wilderness, and even though I didn't see any on my hike to Sheep Lake, signs of them were all around. Sheep Lake is in a beautiful setting, regardless of what season you have chosen to hike here. This hike is well worth the effort. There is an alternative return hike available. If you continue on past Sheep Lake, you will come to the PCT #2000. Bear right on the trail and follow it back south toward for about 5 miles where you will intersect Trail #101. You can follow this trail back to the parking area where you began the hike. It is about 4.5 miles from the PCT to the parking lot at Walupt Lake. Travel east on US Hwy 12 for about 48 miles to Randle. From Randle travel east on US Hwy 12 for about 13.3 miles to the junction with Forest Road 21. Turn right (south) onto FR21 and follow it uphill for about 5 miles. At this point you will see Forest Road 2110 on your left, which is the road to the Glacier Lake trailhead, but you continue straight ahead on FR21. In another 8.1 miles you will come to the junction of Forest Road 2150, which is the road to the Berry Patch trailhead and many hikes in the heart of the Goat Rock Wilderness. Nevertheless, you continue straight ahead on FR21 for another 2.9 miles. Here you will come to the junction of Forest Road 2160. Bear left onto FR2160 and follow it across the creek and up a steep hill for another 5.2 miles to Walupt Lake. There is a campground on the northwest shore of the lake, and the trailheads are at the far east end.